Auckland Technical School opens in a former cabinet making factory in Rutland Street with 137 students enrolled for night classes in vocational education and the trades. George George is appointed the school's first director. 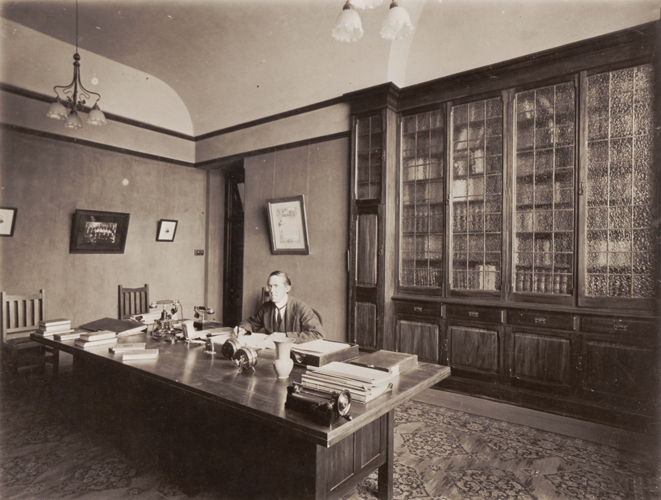 1902 — George George, Auckland Technical School’s first Director, in his Rutland Street office. In a triumph for colonial education, the school scores more exam passes than any of the larger technical schools in London. Expansion plans forge ahead with the purchase of land in Wellesley Street East. A day technical school opens. The institution is renamed Auckland Technical College. Minister of Education James Allen formally opens the institution with the new name of Seddon Memorial Technical College, in remembrance of the Premier and Minister of Education, Richard Seddon. Following 20 years as director, George George resigns. His successor George Park is appointed. 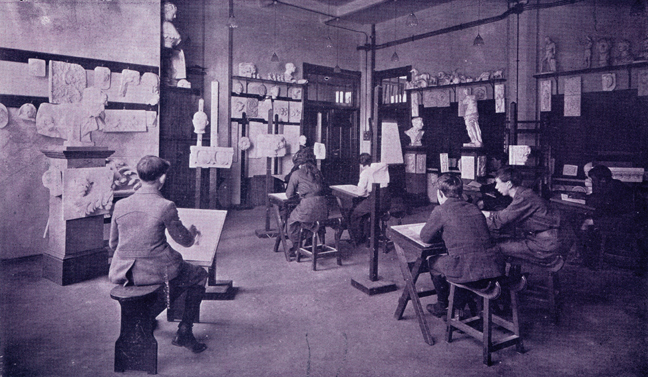 At the time there were 1683 students enrolled. 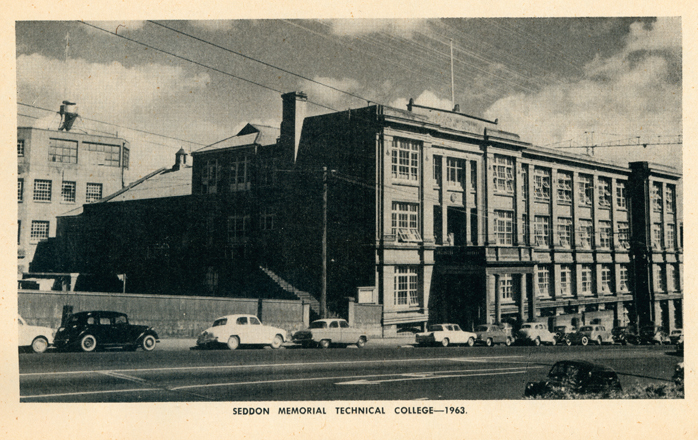 Seddon Memorial Technical College is now the largest school in New Zealand, with 4,212 students, 59 full-time staff and 93 part-time staff. George Park retires. Horace Scott is appointed principal and the college introduces a senior business course. 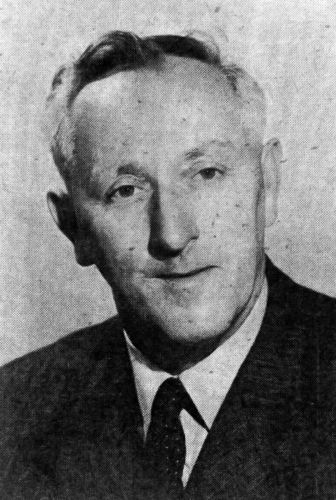 1946 — Horace Scott appointed third Principal of Seddon Memorial Technical College. Training is provided to overseas students for the first time. Under the Colombo Plan, the institute takes trainee trades teachers for a year from countries such as Malaysia, Ceylon (Sri Lanka), Thailand and Borneo as well as the Pacific region. Science students, under the guidance of Ron Waddell, make a television broadcast from a transmitter, three years before television is available in New Zealand homes. 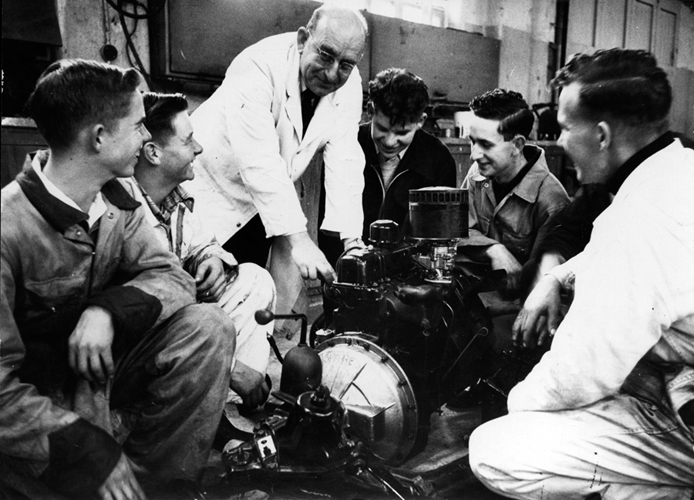 1957 — Staff and students of Seddon Memorial Technical College examine the features of a new internal combustion engine, presented to them by the Auckland Garage Proprietors’ Association. A carpentry training scheme for Māori youth is introduced in association with the Department of Māori Affairs. It is the first so-called ‘sandwich’ course to be introduced, with trainees alternating between the college and construction sites during the two-year training period. The college separates into two institutions — a technical high school and a technical institute, both under the same board of managers. Roderick Keir is appointed to lead the technical institute and Sidney Lee as principal of the technical high school. The Department of Education heralds the move as a “major turning point in the history of New Zealand’s technical education system”. 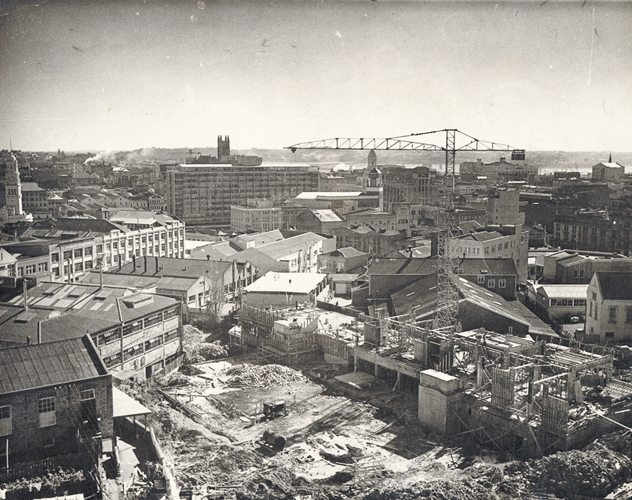 1961 — A Block, now the University’s main administration building, under construction. The technical division is renamed the Auckland Technical Institute (ATI) and, under the Education Amendment Act 1963, is officially recognised as offering advanced vocational education. The technical high school division is relocated to Western Springs, where it eventually becomes Western Springs College. ATI remains on the City site with its own boards of governors. Technical institutes are the fastest growing sector in tertiary education, with ATI leading the way by introducing the country’s first full-time technicians’ course – the New Zealand Certificate in Engineering. Cyril Maloy is appointed principal. K Block opens to accommodate plumbing, welding and automotive classes, catering for 315 full-time students. 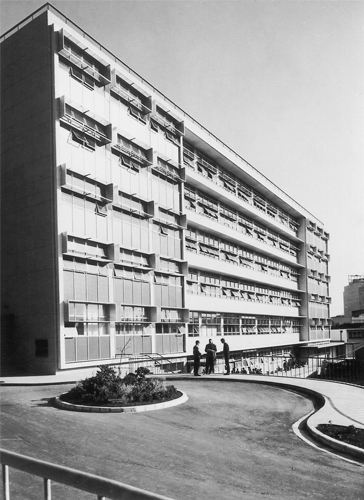 It is the first building in New Zealand specifically designed for use as a technical institute. ATI’s first satellite institute, Manukau Technical Institute, opens in Otara. 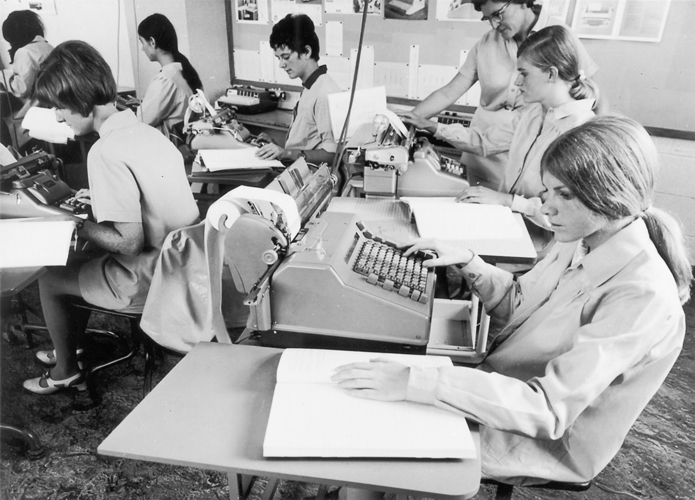 1970 — Senior business class, Auckland Technical Institute. Ivan Moses is appointed principal, with 800 full-time students enrolled. ATI has nine departments within four newly established schools: Engineering, Science, Arts and Commerce. ATI is recognised as the country’s largest technical institute and, in a privilege rarely granted outside Great Britain, gains the right to run The City and Guilds of London Institute’s most advanced cookery course. A fifth school opens at ATI: the School of Health and Biological Science. ATI’s second satellite, Carrington Technical Institute, opens in Mount Albert. Both Carrington and Manukau break away to form new independent technical institutes, now known as Unitec Institute of Technology and Manukau Institute of Technology. ATI runs its first Māoritanga course, covering oral fluency, values and culture. Health science courses are transferred to ATI’s new campus at the former North Shore Teachers’ Training College in Northcote, which officially becomes Akoranga Campus in 1985. ATI is able to offer students on-screen computer experience for the first time following government funding for computer equipment in technical institutes. The Commerce department is split into three separate departments: Accountancy and Law, Management Studies and Secretarial Studies. More than 300 full-time tutors are now employed across ATI. John Hinchcliff is appointed principal. The first Māori and Pacific Island Liaison Officer, Jerry Norman, is appointed as part of a move to increase representation. ATI celebrates its 25th birthday with an open day for the public, which attracts extensive news media coverage. Two hundred courses are run by ATI, making it the largest on-campus teaching institute in the New Zealand polytechnic sector. The Education Act 1989 marks a watershed year for polytechnics: providing long awaited autonomy and the right to confer degrees. To mark the occasion, ATI becomes Auckland Institute of Technology (Te Whare Takiura o Tamaki Makau Rau — the house of learning of Tamaki, the much desired place). With bulk funding introduced, the Bachelor of Health Science (Physiotherapy) is approved and AIT becomes the first polytechnic authorised to award a degree qualification. Te Ara Poutama (Faculty of Māori and Indigenous Development) launched as the first Māori faculty in a New Zealand polytechnic. 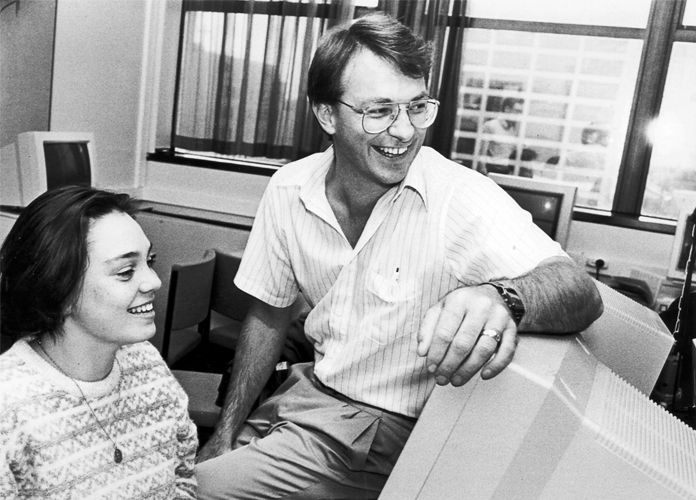 1991 — Former Education Minister Phil Goff on the staff of the new Diploma in CommunicationsStudies, which became the Bachelor of Communication Studies the same year. A new university crest is adopted and its design is representative of a Māori taiaha, which is symbolic of forging new ways. A cohort of nursing students become AIT’s first graduates to be awarded a degree – the Bachelor of Health Science (Nursing). AIT becomes the first New Zealand polytechnic to offer a master’s programme, provided in physiotherapy, and is the first polytechnic to offer the Bachelor of Applied Science degree. 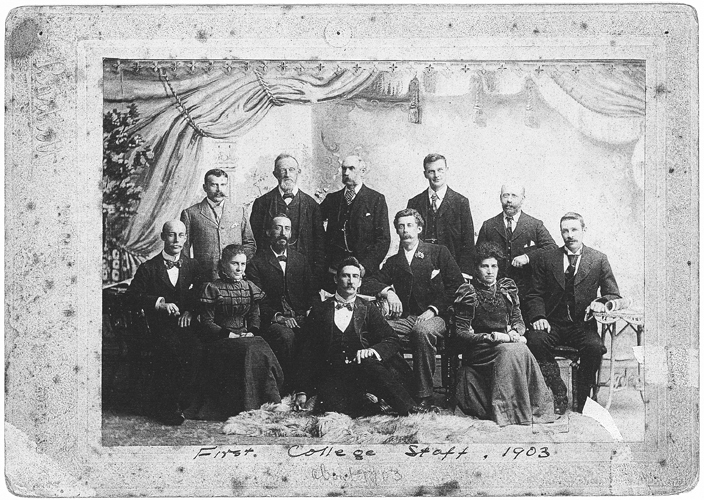 The first alumni association in a New Zealand polytechnic is formed. Pauline Kingi is named the new council chair, becoming the first Māori and the first woman to hold the position since the institute moved into the tertiary sector. A new building opens for the Department of Hotel and Restaurant Studies. More than 1,000 people attend the official opening of the AIT marae (Te Purengi). A building for the Faculty of Science and Engineering in St Paul Street opens. AIT acquires hostel accommodation for 160 students in Mount Street, close to the City Campus. The Auckland Chinese Centre, a partnership between AIT and the city’s Chinese community, opens as part of AIT’s School of Languages. AIT becomes the first polytechnic in New Zealand to offer a Bachelor of Engineering degree. AIT celebrates record student numbers: 26,000 students enrolled, with 57% in full-time study. The institute announces it will offer the Doctor of Philosophy. To celebrate its first graduation procession, 600 AIT graduates march proudly to Aotea Centre. AIT signs a Memorandum of Understanding in co-operation with the University of Auckland and bids for university status. 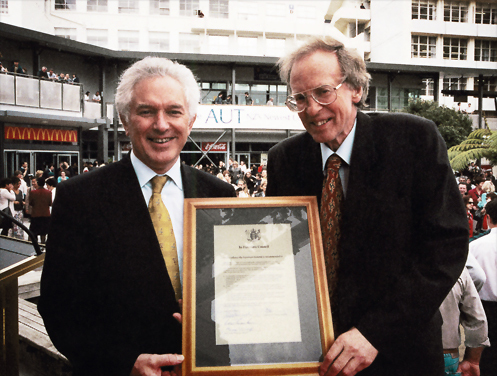 1999 — Tertiary Education Minister Max Bradford (left) and AIT President Dr John Hinchcliff at the announcementthat the institution would become a university from 1 January 2000. AIT makes history as New Zealand’s first polytechnic to become a university, and renames itself Auckland University of Technology (AUT). Dr Tony Lanigan is appointed Chancellor and John Hinchcliff is appointed Vice-Chancellor. The University is accepted as a member of the Association of Commonwealth Universities, and its new programmes are now subject to quality assurance by the Committee on University Academic Programmes. There is 40% growth in international students compared with the previous year, corresponding to 1,481 international students enrolled from 55 countries. AUT joins the Global University Alliance to deliver university-level, online learning internationally. AUT becomes the first New Zealand university to offer online enrolment. Yachtsman Sir Peter Blake receives AUT’s first honorary doctorate. Wyn Hoadley is appointed Chancellor. The new $32 million Learning Centre is officially opened by Prime Minister Helen Clark, providing more than 1,000 study seats, 200 computer terminals and a lecture theatre for 250 people. The Sport and Recreation Centre on the Akoranga Campus is opened, providing top performers state-of-the-art training and assessment facilities. To accommodate rapid growth, the University has embarked on a $160 million five-year capital works programme. 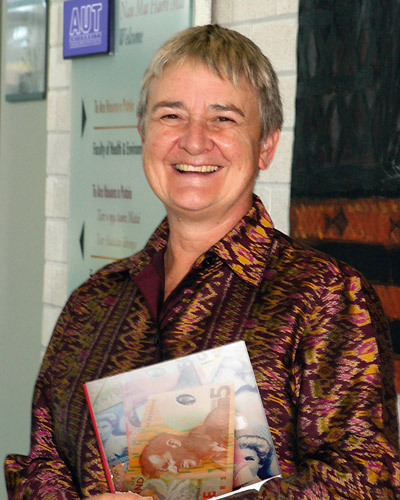 Dr Debbie Blake (Faculty of Science and Engineering) is honoured as AUT’s first PhD graduate. AUT establishes a Centre for Māori Innovation and Development. 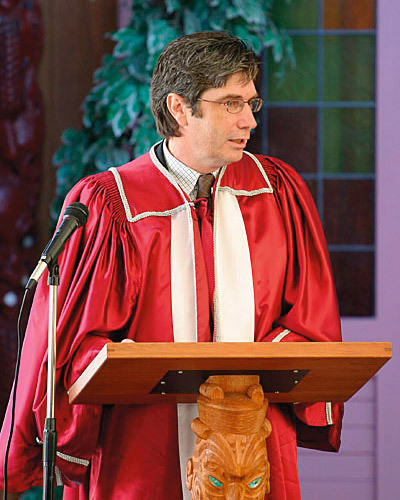 The University farewells John Hinchcliff who has led the institution for the last 20 years. Derek McCormack is welcomed as the new Vice-Chancellor. AUT signs a Memorandum of Understanding with the mana whenua of Tāmaki Makaurau – Ngāti Whātua o Ōrākei, signalling a mutual commitment to making a positive difference to the region’s economic and social well-being. Academic clusters are restructured into Applied Humanities, Business, Health and Environmental Sciences, Design and Creative Technologies, and Te Ara Poutama. The Office of Pasifika Advancement is established; the first of its kind in New Zealand. Sir Paul Reeves is appointed Chancellor. The new Business School building opens and receives a number of industry awards for its design. To enable the University to participate in commercial investments, the subsidiary company AUT Enterprises Ltd (AUT Ventures) is established. The University receives its biggest increase of postgraduate enrolments and completions to date. Since 2001, there has been a 46% increase in postgraduate enrolments across the University. Hinematau McNeil becomes the first Māori PhD graduate at AUT with research on the mental wellness of kaumatua in Tuhoe. AUT has the highest number of students annually completing part of their programme in another country, with 150 students involved in exchange programmes and over 200 students undertaking co-operative education in 27 countries. 2006 — Political economist and former MP Dr Marilyn Waring is appointed to the University’s Institute for Public Policy. 60 Vice-Chancellor Doctoral Scholarships are introduced, each worth around $90,000. AUT installs New Zealand’s first radio telescope in Warkworth. It is a major step towards New Zealand's participation with Australia in the international mega-science project, the Square Kilometre Array. The Government provides significant investment to AUT to advance research capability and performance, for the development of the new Manukau Campus, and the Millennium Institute of Sport and Health. Close to 24,000 students from 83 countries are enrolled at AUT. AUT’s Business Faculty is renamed the Business and Law Faculty with the inaugural intake of students in the Bachelor of Laws degree. AUT partners with the Millennium Institute of Sport and Health to open the AUT Millennium campus in Mairangi Bay, Auckland, focused on high performance athlete development and success. The University holds its first University-wide summer graduation (in December), allowing more graduands to attend the ceremony. 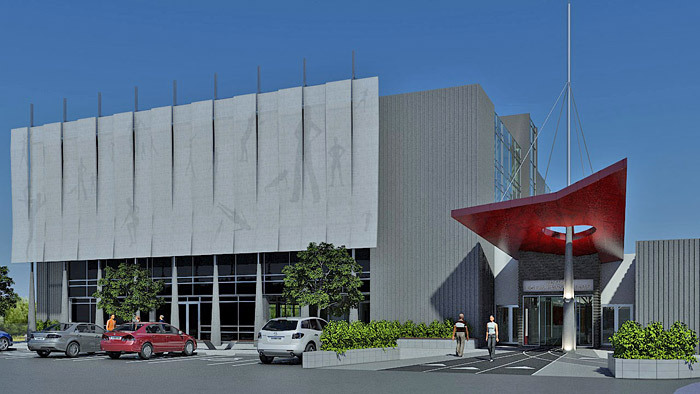 2009 - AUT opens its Millennium campus on Auckland's North Shore, on which it will house New Zealand's premier training and research centre for high-performance sport. 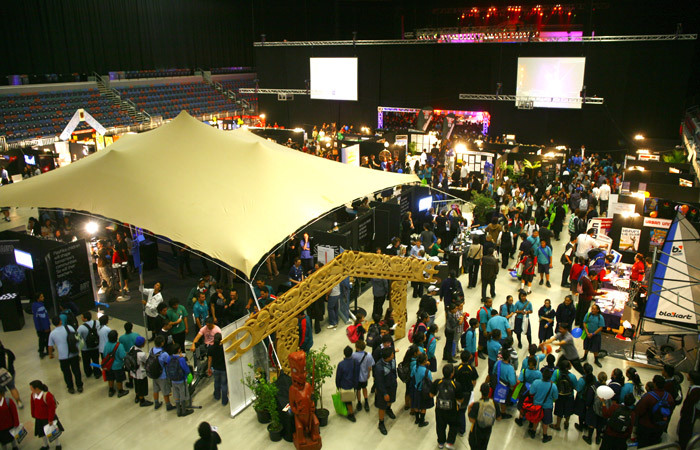 2009 - Maori Expo is bigger than ever ... more attendees, exhibitors and performers. The South Campus is officially opened by Prime Minister John Key, with more than 400 founding students. 125 Māori and Pasifika postgraduate students graduate, this includes AUT’s first doctoral candidate to complete a thesis in te reo Māori. 2010 - AUT University's South Campus opens for business. 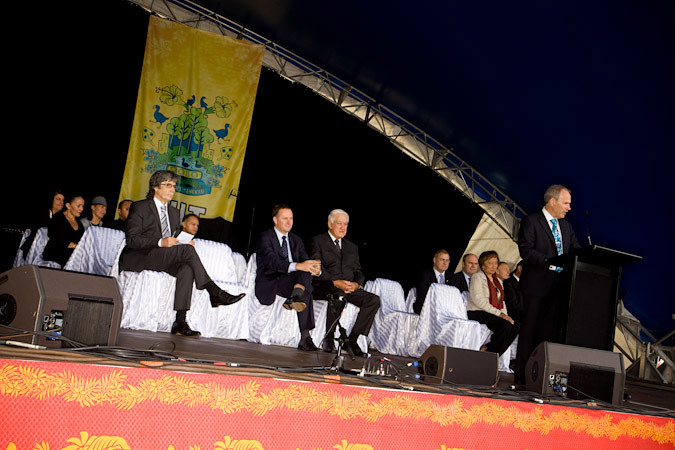 On stage at the official opening are: Manukau Mayor Len Brown (speaking), and (from left) AUT Vice-chancellor Derek McCormack, Prime Minister John Key and AUT Chancellor Sir Paul Reeves. The Business School gains international AACSB accreditation, placing it within the top 5% of business schools worldwide. The Faculty for Māori Development Te Ara Poutama achieves international recognition through the launch of the International Centre for Language Revitalisation at the United Nations in New York. The National Training Centre is opened at AUT Millennium by Dr Jacques Rogge, President of the International Olympic Committee. Chancellor Sir Paul Reeves passes away. John Maasland is appointed Chancellor. After only 12 years as a university, AUT gains a place in the world’s top 500 universities (top 3%) for the first time in the QS World University Rankings. 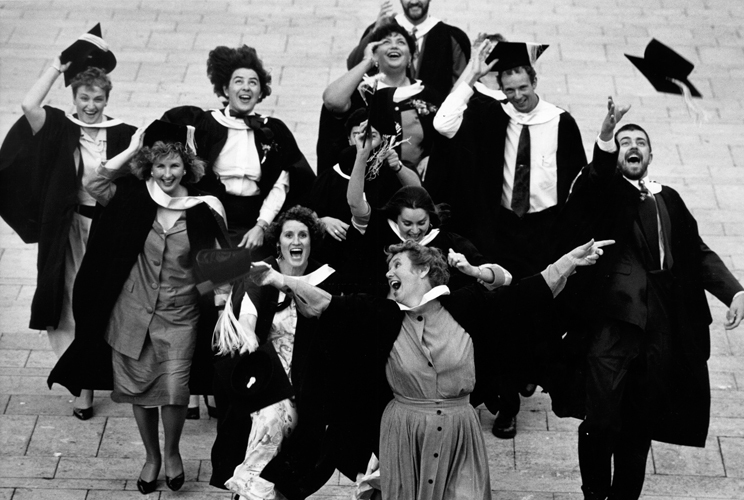 The first cohort of students at the University’s South Campus graduate in December. The AUT City Campus is transformed by the opening of the Sir Paul Reeves Building, adding 20,000 square metres of world-class facilities for collaborative research, learning and teaching. The building wins several prestigious architectural and building awards. Prime Minister John Key announces the Government’s commitment to providing tuition funding to allow the South Campus to expand to up to 4,000 EFTS by 2020. AUT is now New Zealand’s top ranked university for research in sport and exercise science. AUT Internz, a new initiative offering graduates the opportunity to gain work experience in the United States, is launched. Nine graduates are placed at organisations in New York, Los Angeles and San Francisco. AUT becomes the first and only university in New Zealand to be certified with the Rainbow Tick, recognising its commitment to gender diversity and inclusion. AUT’s capital development programme, with investments of more than $400 million over the University’s three teaching campuses, gains initial approval from the Ministry of Education. Dr John Hinchcliff becomes the first Emeritus Vice-Chancellor, in recognition of his role in transitioning the organisation into becoming a university in 2000. 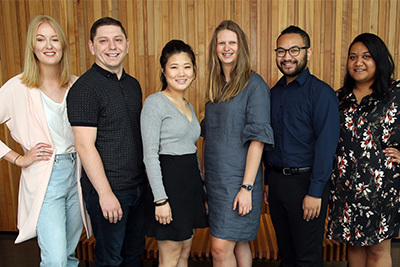 The Woolf Fisher Trust agrees to fund scholarships for new AUT students who are the first in their family to go to university, with a commitment of more than $2 million over the next 10 years. AUT becomes New Zealand’s second largest university. Total enrolments reach 19,798 EFTS. AUT is ranked 12th in the world for international outlook in the Times Higher Education world university rankings. Uniprep – a six-week summer programme run at the South Campus that provides students with an introduction to university life – is established, with 85% of the 136 participants going on to study at AUT. AUT reaches 850 doctoral students. Postgraduate students now make up 17% of the University’s student body. The AUT Edge Award, a co-curricular programme designed to increase students’ leadership and employability skills, launches with 825 students registering. A School of Economics is established, sitting within the renamed Faculty of Business, Economics and Law. AUT becomes a five-star university (QS Star ratings) and achieves five stars in sub-categories for teaching, internationalisation, employability and inclusion. AUT is recognised as one of the world’s top young universities (under 50 years old) by both Times Higher Education and QS World University Rankings. AUT is ranked number one in New Zealand and 29th in the world for Sports Science by the prestigious Academic Ranking of World Universities. The Mana Hauora Building is opened by Prime Minister Bill English. The new hub of the South Campus provides capacity for 3,000 EFTS and offers space for community and industry events.